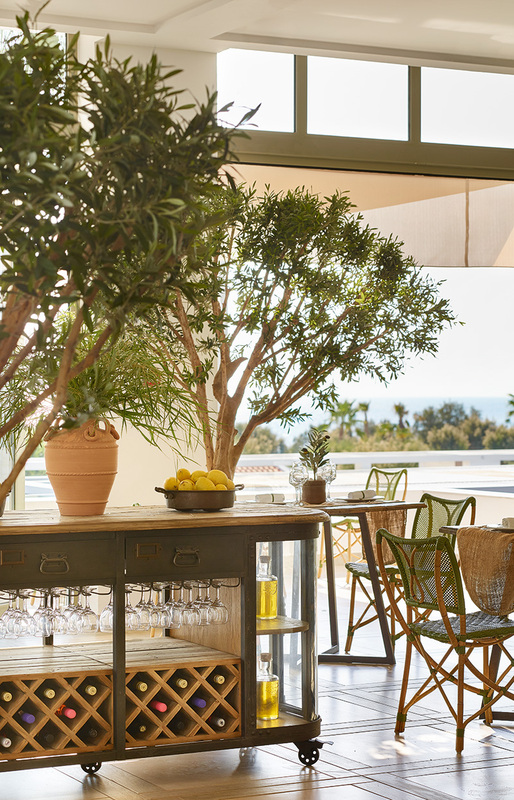 Grecotel’s All-In Resort on Rhodes Island gets a regal rebrand in 2019, welcoming guests to its remodelled property and introducing Grecotel LUX ME Rhodos. Featuring the Luxury Made Easy All-Inclusive concept that Grecotel offers, it’s the place to be this summer. Guests don’t have to worry about a thing – luxury simply becomes a part of your life. Set 15 km from Rhodes Airport, near the best-preserved medieval town in Europe, this seaside paradise lies surrounded by palm trees and a delightful Blue Flag beach. The elegance of Grecotel Luxe All in Living is reborn in open-style public spaces, incredible water features and splendid light-filled buildings. Enter a water wonderland featuring marvellous pools and luxurious bungalow village accommodations. 276 guestrooms and 46 bungalows have been completely transformed. Choose from an exciting collection of open plan guestrooms, family rooms, stylish suites, along with unique bungalows. Accommodation can be by the pool with either an open plan configuration for couples or separate bedrooms for families. All-inclusive living was born from the vision of a carefree waterfront lifestyle. The refreshing holiday concept ensures worry-free stays with personal, modern service, outstanding food, beverages, events, activities and entertainment. You don’t have to plan things too far ahead thanks to 24-hour reception, free Wi-Fi in public areas and supervised children’s entertainment at Grecoland. Luxe All-in Living is also available at Grecotel LUX ME White Palace, Luxury Resort in Rethymno, Crete, and at Grecotel LUX ME Daphnila Bay Dassia, Luxury Resort in Dassia, Corfu. Take a culinary trip around the world: six sublime new restaurants and bars overlooking the Aegean Sea offer a la carte Greek, Italian, Asian and Fusion cuisines. 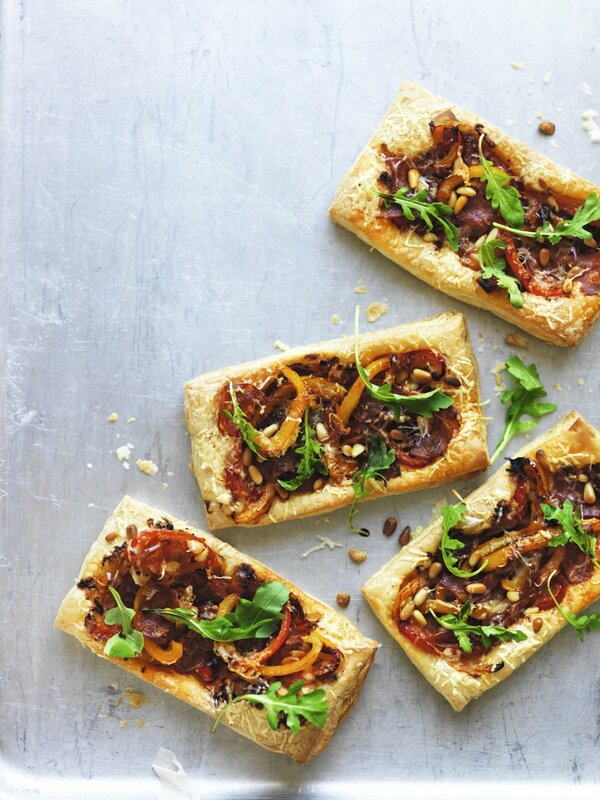 Savour exceptional culinary adventures based on pure, simple and incredibly fresh ingredients. 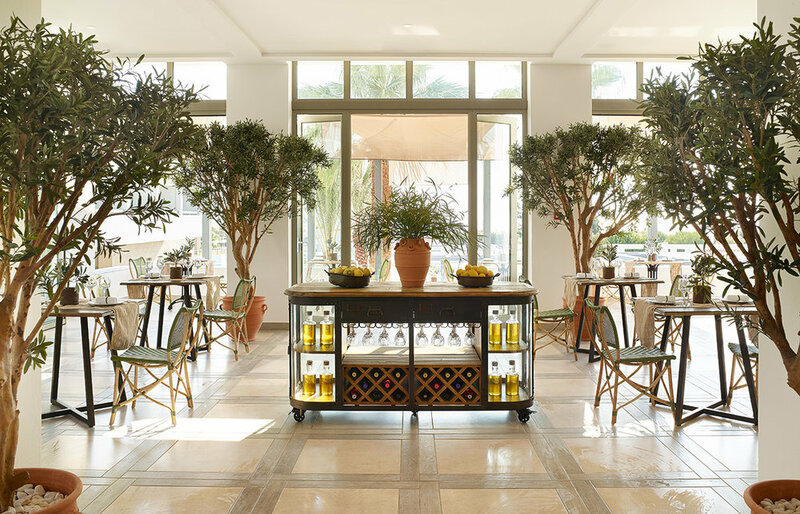 A 24/7 lounge, a patisserie & chocolaterie, a crêperie & gelateria, premium brands, snacks and ice bars, wine tasting areas with over 150 labels to choose from, pool & beach service and Grecotel’s little luxuries await at no extra charge. Kids can stop by the Tasty Corner to chow down on a variety of healthy choices. ‘Petite Gastronomie’ offers farm to table fruit and veg and baby food. The Elixir Beauty Spa features an indoor pool displaying a pyramid-shaped glass roof, impressive water features and tropical gardens. Guests can work out in the fitness room with state-of-the-art cardio equipment or relax and rejuvenate in the sauna, steam room, private massage rooms and beauty salon. The Kids Club has plenty to keep children occupied, with culinary lessons and creative activities happening throughout the week. While parents relax, kids can hit the playground, make a big splash on water slides or swim in a freshwater pool. From morning to night, teens and teenagers can join in on sports, games and competitions. And it’s all free! Guests of any age can look forward to dancing, folklore shows and music in live acts and super DJ shows. Let yourself go with watersports, beach volley, mountain biking and memorable parties. Rhodes Town is only a short hop away and has many castles, windmills, squares and shops to explore. Plan your entertainment. Make online reservations for a la carte restaurants. Book spa treatments and wellness activities. Explore benefits, offers, weather forecasts, tips and more before and during your stay. 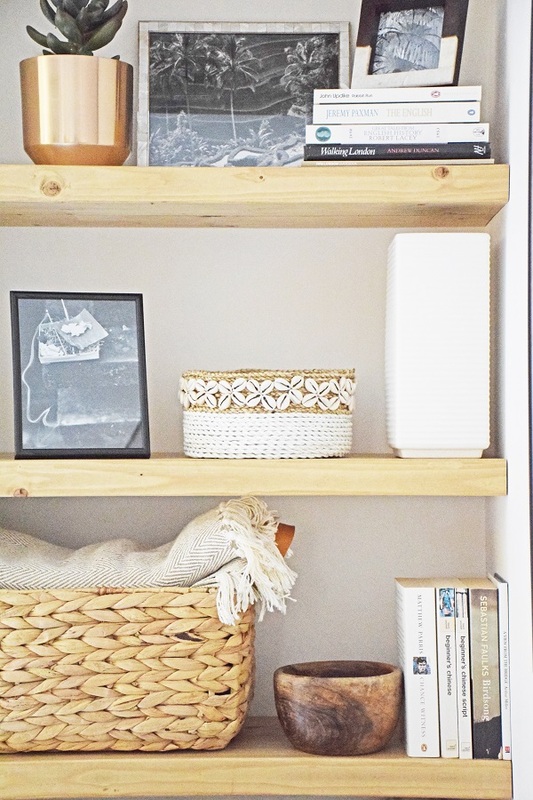 As the decorations come down, revealing the bare bones of our homes once more, it sparks a desire to re-instate a sense of calm in our surroundings. We’re all for that! And instead of running from the January blues this New Year we’re happy to embrace it with dark enveloping blues that still feel cosy but also decadent, smart and sophisticated. A fresh coat of paint is one of the easiest ways to transform a room. Whether it’s on one wall or on all four, this intense shade of blue will look fabulous when paired with crisp white. The white painted floor prevents the room from looking too dark, and the wood bed frame and gold bedside table add just the right amount of warmth. Blue Movie Dead Flat Matt Emulsion Paint, from Dowsing and Reynolds is a good match. If painting the walls is just too much of a change you can always add an accent colour in blue. This lovely sapphire blue velvet chair provides a punchy statement in a bedroom or a corner of the sitting room. The combination of blue and gold is not only regal, but it is highly en vogue; sapphire blue is a big upcoming trend, and when combined with gold it really 'sings'. Sometimes just a touch is just enough and this prestigious wall art canvas adds a twist to a Vermeer Classic too. Ant Fox's subversive epigrams combine the humorous with the traditional, executed in a distinctive style drawn from the Dutch Golden Age of painting. And a vibrant dose of blue! All items are from The French Bedroom Co who offer traditional French designs with a hint of contemporary styling, paired with quirky, eye-catching accessories. Owning one-of-a-kind, bespoke furniture is no longer a privilege of the wealthy or the realm of professional designers. Upstyle Your Furniture shows the rest of us how easy it is to create custom pieces of furniture with a bit of imagination and easy-to-find materials. Why spend a fortune on designer furniture when it's so easy to simply restyle old or inexpensive pieces? Inside, readers will find everything they need to create a look that complements their unique personality and style. 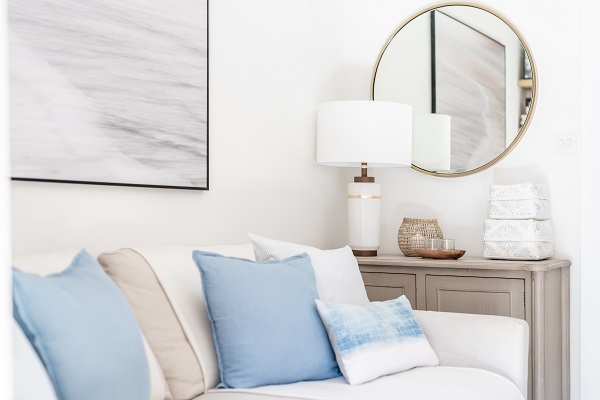 For sewers who have mastered the basics, home décor items such as curtains and drapes are some of the easiest things to make, and they are also one of the quickest ways to give any room an instant facelift. Combining clear, accessible tutorials with practical advice on choosing, styling, and sewing fabrics, Upstyle your Windows is a must-have guide for all creative homemakers and design-savvy DIY-ers looking to customize their windows with their own distinctive style. Paperback, 176 pages, Published February 24th 2015 by St. Martin's Griffin. Terms and conditions: The prize draw is open to individuals in the UK residents aged 18 or over. Any person or persons connected with Heart Home magazine, without limit, their families, agents, or anyone else involved in the administration of this offer are not eligible to enter. All entries must be received by 06:00 15th February. By entering this competition you consent to share your email, name and postcode with Heart Home magazine, who may wish to send you mailings in the future. There will be one winner who will receive the prize above. The prize must be accepted as offered (there are no cash alternatives) and they are non-transferable and non-refundable. The winners will be chosen from the list, at random, on 16th February and the winners will be notified by email or post within 7 days. No correspondence will be entered into. Unclaimed prizes will be redrawn after 28 days of the original draw. Heart Home magazine reserves the right to replace the prize with a product of equal value, if necessary. The winners will be asked to confirm their postal address before the prize is awarded. Details of the winners may be posted on the Heart Home magazine website and Facebook page. By entering this competition, you automatically agree to the terms and conditions above. Promoter: Heart Home magazine, 4 Oak Crescent, Wickford, Essex, SS11 7FF. 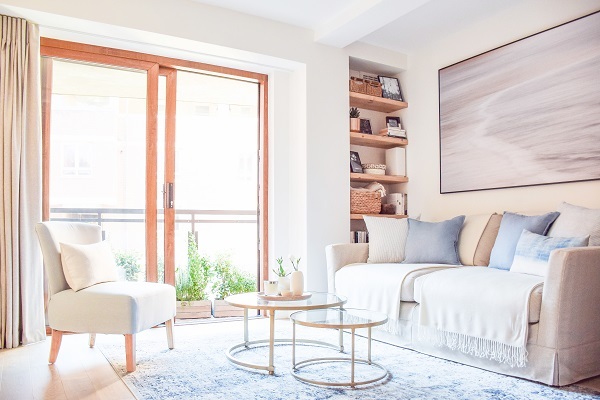 This recently completed one bedroom pied à terre apartment in Covent Garden London, was sent to us by Elly MacDonald who runs a small interior design business servicing homes in London and Surrey. As always when we see a stunning project that we’d like to move into ourselves, we had a few questions…. It’s a one bedroom flat in a modern apartment block, with a petite terrace overlooking a courtyard below. 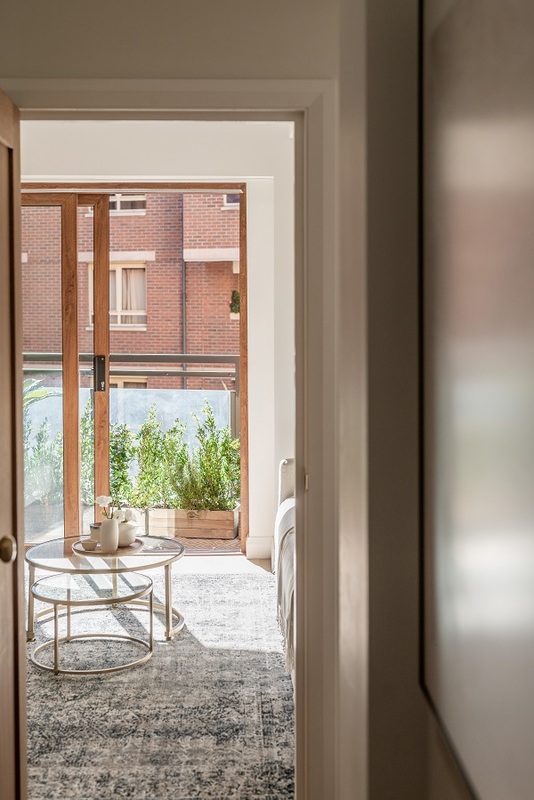 The client is very sociable, who uses it as a pied à terre when up in London, which impacted the design a little given that it’s not a full-time home. However she wanted to keep a keen eye on re-sale considerations so we made sure to still include plenty of storage etc. Insufficient storage is a perennial issue in apartments of this size, so we maximised use of space inside furniture, almost doubled the kitchen cabinetry storage space, and added built-in shelving and cubbies wherever possible, for instance either side of a mechanised TV stand hidden away inside a bench when not in use. How did the family/owners intend to use their home? It’s really just used at weekends, for a night or two at a time, as it’s ideally located within striking distance of the West End and the Theatre District. We incorporated a sofa bed into the living room, and maximised the seating options in there so that the client is able to welcome family and friends over as guests. We tucked the TV away inside custom cabinetry, with an electric mechanism so that it can be hidden away when entertaining guests. The client does not do much cooking there, so we used a wipeable kitchen paint as the splashback instead of tiles to help the kitchen blend more seamlessly into the open plan living room. It’s just off the market square in Covent Garden, tucked behind a busy street away from the tourist hustle and bustle. Working on a property in such a central location came with a few logistical challenges, but the end result was very much worth it! To brighten and lighten the space from its previous dark and dated form without it becoming a bland minimalist box; to maximise the natural light coming from windows on just one side of the property; to keep the overall scheme fairly neutral and ‘not trendy’ but to also bring in a few accents of colour; to bring in a sense of depth and history to a contemporary scheme, as the interior of the property was very new and lacked architectural detail. So we maximised the feeling of spaciousness by lightening up the walls and flooring but maintained interest and depth through using lots of natural finishes, from rattan and seagrass through to antiqued brass and mother of pearl, vintage textiles from Thailand and the occasional piece of antique-style furniture, and plenty of stunning accessories and artwork. Is there any interesting history or background to the project that will interest our readers? We discovered just in the nick of time that the dining set the client had inherited from the previous owner was a set of authentic Charles Rennie Mackintosh DS3 chairs and DS2 table, which were discontinued in the 70s, making them really quite valuable – the client understandably hadn’t realised as it often takes a design background to spot these things, and we were very happy to give her the good news that they should not in fact just be thrown away! Were there any period details to be preserved or limitations on the design? We had to work around a series of structural reinforced concrete columns and beams, which were mostly fine as we just incorporated them into the structure of the walls and ceilings and used the same emulsion paint on them to blend in. However there was one tricky column right in the centre of the main kitchen/living room wall, which we solved by wrapping a raised peninsula dining bar around its width. What was the scope of the job? Renovation, building work, or just decorating? Renovation of whole flat (living/kitchen, hallway, bedroom, terrace), decorating and accessorising. With client work I usually style up projects with accessories, artwork, textiles etc for my portfolio photoshoot, and then invite the client to come in and ‘shop’ for as many or as few of the items as they like – in this case the client loved almost everything so I ended up taking disappointingly little away again! Where do you go for inspiration when starting a new project? I always ask my clients to give me three or four adjectives of how they would like the finished space to feel, and then use that as the basis of the project. I very commonly find that clients know exactly how they want their home to feel, but find it a challenge to translate that description into an actual design scheme, especially with the added considerations of getting things like the lighting, storage etc correct. In this case we had ‘light-filled’, ‘fresh’ and ‘welcoming’. How do you present a new design concept to your clients? What tools do you use? A mixture of floor plans and elevations, combined with design scheme boards and sample boards – I use a lot of stunning natural finishes in my work, and find they can only be truly appreciated by touching them and seeing in person the weave of the linen or the grain of the whitewashed wood or the patina of the antiqued copper. Did the client have much input into the finished design? Yes a reasonable amount, I really love it when clients jump in with opinions or requests, or challenge me on aspects of the project. In this project the client had a few specific requests, such as the monochrome artwork over the master bed and the deep indigo Persian rug in the living room. Did the client have existing items that needed to be incorporated into the new design? No, everything was brand new. She was fed up of the dark heavy furniture and textiles and wanted a brand new fresh look. I do love working on projects where we have the challenge of incorporating existing items, but it’s also exciting to have a totally blank slate. Can you give some details of the products you used. Designer names, shops, websites? I’d been desperate to include the stunning tan leather/metalwork bar stools from West Elm for a long time, and was so pleased when the client jumped at the chance to incorporate these. Another favourite were the vintage Thai indigo and white Khmer silk textiles we had made into lumbar pillows – I have a huge weakness for hand-woven artisanal textiles, and own an arguably over-extensive collection from Asia that I’m slowly working my way through! 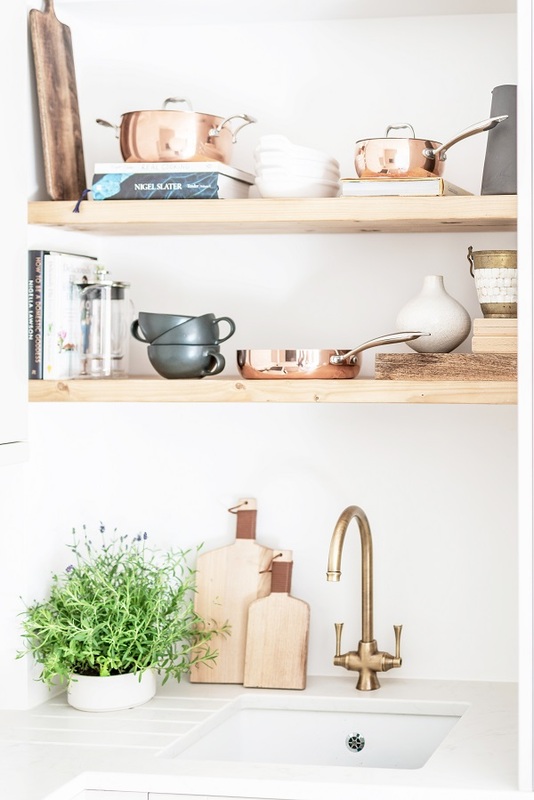 And lastly I love Nkuku as my ‘go to’ for fabulous brass picture frames and quirky accessories. What aspect of the renovation are you most happy with? How well the open plan kitchen/living room turned out, incorporating the kitchen cabinetry as seamlessly as possible into the petite space. It was the first time I’ve used a dining bar peninsula, and after agonising over the design and dimensions for days I was very pleased to see it turn out perfectly! By running the Carrara marble-effect quartz worktop all the way around to the dining bar, we avoided any jarring transition between the kitchen and the lounging areas. I always try to tiptoe a little outside the box on every project I take on – design is a lot more rewarding and fun with a small amount of risk-taking! What aspect of the renovation are your clients most happy with? She could not believe how light and bright it is now: ‘I can’t believe it’s the same flat!’ were her exact words! It’s my favourite part of the project seeing my clients’ eyes light up when seeing the big reveal for the first time. Lorena Canals will present at the next edition of Maison & Objet, Paris, 18-22 January, her three new collections of washable rugs and decorative accessories: Tribute to Cotton, English Gardens, and Lobster. These three new collections have been inspired by the brand´s origins and the designer´s love for nature. These passions have been transformed into cohesive and comprehensive collections, with a great focus on elaborate details. The collections will also be presented at NY Now, New York, 3-6 February, and at Intergift, Madrid, 6-10 February. Craftsmanship: The ethos of Lorena Canals was built around the attributes of cotton – it´s versatility, warmth and softness, amongst many others. So, it was only natural for Lorena Canals to pay homage to this safe and eco-friendly natural material with the Tribute to Cotton. This collection transports us to India´s endless cotton fields, thanks to its soft tones and variety of textures, and is one of Lorena Canals most comprehensive collections, with different models of rugs, cushions, baskets and garlands. This collection is a tribute to a material which represents the values of Lorena Canals, such as craftsmanship and a commitment to safe guarding the environment. Joy: As a loyal lobster lover and all things maritime, Lorena Canals launches a fun, marine style collection: the Lobster collection. Having grown up by the sea, Lorena Canals has turned her childhood memories into fun carpets and wall hangings, with matching baskets and door hangers, in intense red and natural tones with textures that seem sprinkled by the wind and sea water and softened by the white sand. Lorena Canals’ award-winning designs have garnered international attention for being modern & stylish, yet practical & safe for children. Her fair-trade products are handmade by expert craftsman in India, who use raw materials of the best quality. Their rigorous artisanal process produces environmentally friendly, machine washable rugs and decorative accessories made from natural cotton. All designs are hand stitched and dyed with natural, non-toxic dyes, to ensure durability after washing. The London-based Interior Design company, 2LG Studio, were chosen to interpret C.P. Hart’s 2019 bathroom trends with an exclusive installation. The creative duo, Jordan Cluroe and Russell Whitehead, created a powerful and palpable room-set in red and pink that combines new finishes and bold products. Working with the luxury bathroom retailer’s in-house team for several months, they produced a bespoke room-set for C.P. Hart’s flagship Waterloo showroom - revealed at C.P. Hart’s 2019 product launch in November. 2LG Studio worked with the in-house team to pick cutting-edge products to produce the colourful bathroom design. The BetteLux Oval bath was custom made in pink for the first time to complete the dual-coloured scheme with the Rho basin from Kast in a matching hue. Fantini provides a dose of fun with its I Balocchi pop-art style brassware and freestanding shower in a custom all-red finish. 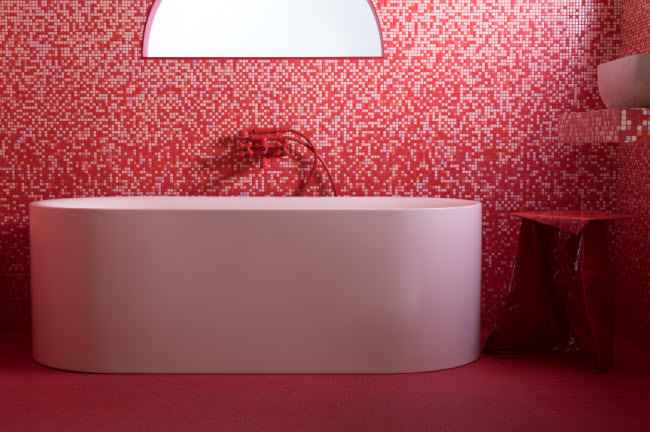 Bisazza’s Opus Romano Matt tiles in both pink and red pull this forward look together. “Red and pink is an iconic colour combo. It is a combo that has been in our minds for a long time and this was the perfect opportunity to experiment with it. Once we knew that Bisazza were on board too, we knew that their extensive range of colours in matt and gloss would give us the perfect opportunity to blend colours and create a jewellery box of a bathroom.” 2LG Studio. With the help of Beck interiors, the set was designed with cut out moon shapes to encourage the viewer to move around the room and see it from new and unusual angles. Speaking of the inspiration for the project, the studio cited the American fashion title Paper Magazine as a source of inspiration. “It had the most incredible red and pink cover the month we sat down to create the concepts. We also have a passion for Italian design and for movies. We couldn't be more excited about it and it has been a big influence on the design of the installation.” 2LG Studio. The collaboration is part of C.P. Hart’s dedicated activity to bring consumers the latest in product and interior design. The bathroom specialist has always been at the forefront of bathroom design, showcasing brands from around the world, regularly for the first time in the UK. The room-set will be on display in the C.P. Hart Waterloo showroom throughout 2019. C.P. Hart will also be showcasing the latest collections in its gallery space, which includes new designs from Bisazza, Bette, Scavolini and more. C.P. Hart also issued its Trend Report for 2019, which is now available to press. C.P. Hart are also proud to welcome Graham & Brown to the showroom as two wallpapers from its collaboration with 2LG has been used within the showroom space, Felt Tip Pink and Buckley Pink. Just what we need for the New Year. A colourful reminder of summer and the countryside from one of our favourite designers, Clarissa Hulse. Her new Dill collection features silhouettes of flowering dill in contrasting colours with firework shaped clusters evocative of British summertime. The colours graduate from deepest teal to pale aqua. Dill Double Duvet, £55, Oxford Pillowcase, £15, Cushion £40. When the bed linen is turned down, the reverse is patterned by what appears to be rows of flowers but is in fact looped shapes created by stamens. The coordinating oxford pillowcases are edged with a peacock blue flat piped trim and an embroidered velvet cushion and knit throw (featuring an undulating wave pattern) complete the look. Dill Curtains, From £75, Cushion, £40. Meanwhile perfect spheres of the ornamental allium are printed onto the new peacock blue Dill curtains. The silhouettes show the clustered heads towards the end of their life cycle, as they turn from blossoming flowers to dried seed heads. The curtains are available in 6 sizes, fully lined with matte silver eyelet headings. Celebrating Pantone's Colour of the Year for 2019, MuralsWallpaper have created a very fitting mural design that embodies the inviting optimism and energy of 'Living Coral'. Expect a refreshing sense of vibrancy and vitality to infuse interiors in 2019 with the new Colour of the Year. A stand-out wall drenched in Living Coral is an ideal way to incorporate the trend-worthy tone into the home, and this wallpaper puts it to work with a playful mix of coral design and the punchy Pantone colour. This lively shade has stayed hidden like coral beneath the reef for long enough, being used in decor only to add a small pop of colour to a minimal space. But now chimes the time for this energetic colour to take centre stage and be the cause of waves of joy in interiors. Living Coral is an uplifting shade that celebrates connected life, and is influenced by the vital role of coral in the marine ecosystem. The new Colour of the Year takes a fond look at nature's beauty and highlights the importance of preserving it, so it's good to know that MuralsWallpaper paper is sustainably sourced and uses only eco-friendly, water-based inks. 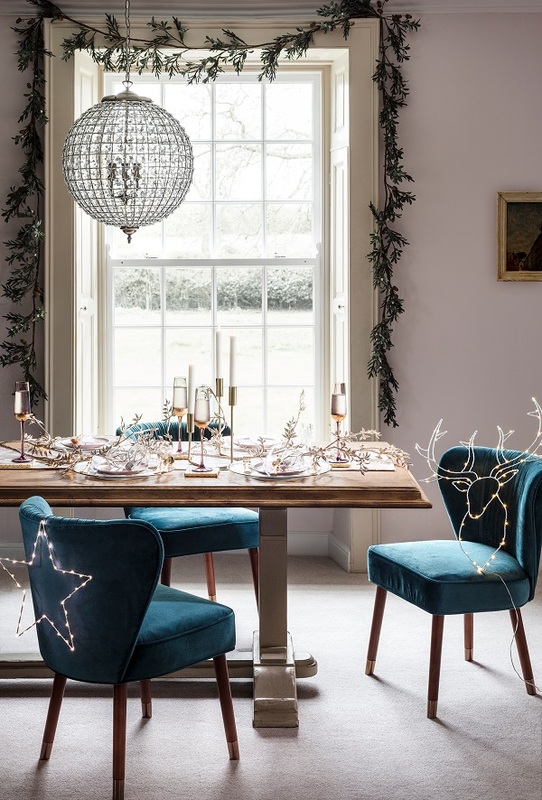 Where would Christmas be without the twinkling magic of candles and fairylights? They can make even the dullest of corners come alive, and make every room look festive for the holidays. And it’s easier than ever now to put lights and candles all around the home with the popularity of battery operated lights. Which of course means no trailing wires and no fire hazards from candles. The tree is the obvious place to adorn with fairy lights but don’t forget other focal points too. A fireplace can look lovely even unlit with a mantle strewn with evergreen foliage and battery operated lights. Add a mass of battery candles on the hearth too for a lovely welcoming warmth. Create a table centrepiece with more foliage, candles, and lots of lovely battery operated tea-lights. Remember that lights at different heights will look more interesting, and these candles will burn long after real candles have burnt out. Don’t limit the lights to the dining table in the dining room. You can also add wall lights or trail fairy lights around the window too. And don’t forget a very warm welcome for your guests too. All images and all products are from Lights4Fun. 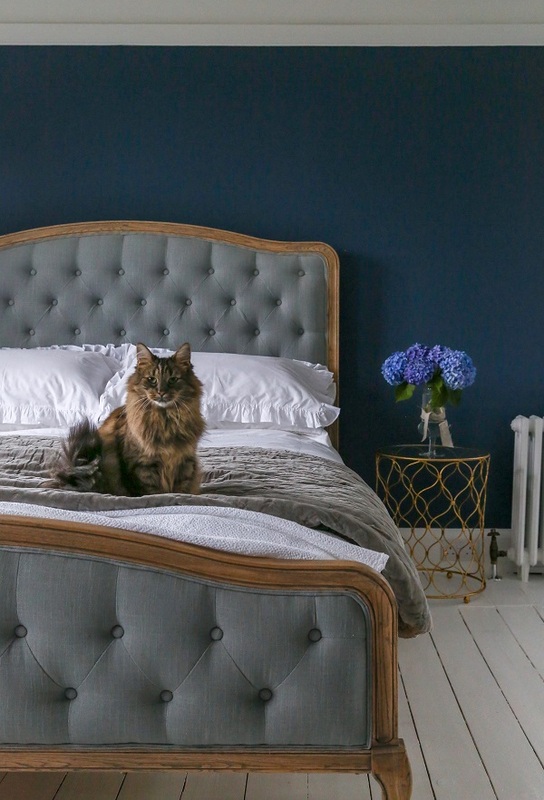 With the launch of their brand new showroom at Parsons Green in January 2019, designer sofa specialists Darlings of Chelsea have dedicated their old Fulham store to their beloved beds and sofa beds. The ‘Darlings of Sleep’ showroom will reopen on the 4th of January and will feature their finest beds and sofa bed designs - including the Andreas range, the Felton range, the Brendon Sofa Bed and the Corby Storage Chaise Sofa Bed. Starring traditional frames, modern fabrics and retro designs, Darlings have a diversified range to fit into different bedroom spaces, whether it be in a traditional mansion or a contemporary condo. So explore the relaxed, opulent store that has a feeling of serenity for customers to feel right at home. With the Fulham showroom just a 15 minute walk away from the Parsons Green showroom, it is particularly convenient for customers looking to invest in a high-quality bed and a luxurious sofa at the same time. There will also be a 35% off sale promotion in January to facilitate any purchases in the New Year. 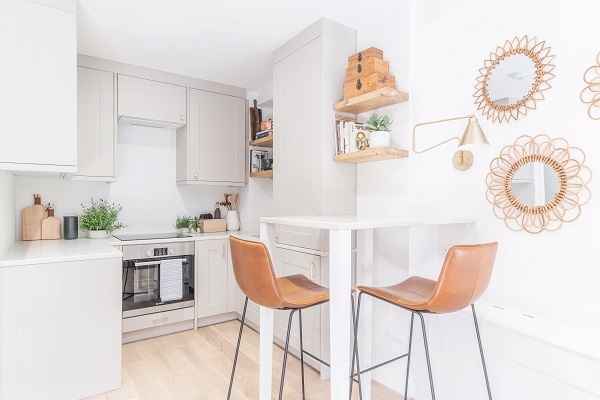 This stunning maisonette in a converted Victorian townhouse has recently been renovated by Shanade McAllister-Fisher for a young professional couple enjoying a bustling city life. The property comprises of two bedrooms; a guest and master, bathroom and an open plan living space boasting spectacular views across London. Perfect for relaxing, dining, and entertaining friends with plenty of cocktails. We asked the designers a few questions about the project. In this case our clients wanted a relaxed, but entertaining space. They required an overall look and feel that could blend their two different personalities. One that would seamlessly mix the natural appeal of a Scandi design with a vibrant and fun collaboration between colour, shapes and texture. The result is a collection of spaces filled with interest, yet reassuringly relaxing. 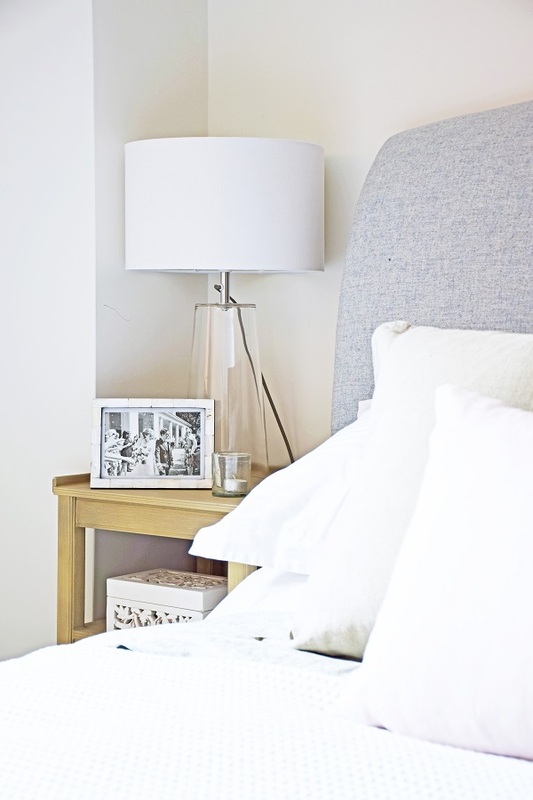 The apartment was in a good condition so the main bulk of the project was centred around decoration and furnishing, however the rooms were consistently vanilla with little usable storage, so to provide greater impact we opted to include a significant amount of bespoke joinery to maximise space. Every project is different but for this project the inspiration came from the owners bold artwork collection. This formed the basis for our gallery wall and helped influence a colour palette for the entire design. I consider art to be one of my most powerful allies when designing, so it was an absolute pleasure to pick through their pieces and add to their collection. Vanity unit - Noir Craft - Bathstore. Basin - Noir Square - Bathstore. Mirror - Patsy - Habitat. Light - Solo Suspension Light - Intueri Light. Absolutely, It was incredibly important to us that the finished project was collaboration. We worked particularly closely together to develop a scheme that created the right mood and feeling while allowing my clients personality to shine through. Pendant light - IC Pendant Light - Flos. 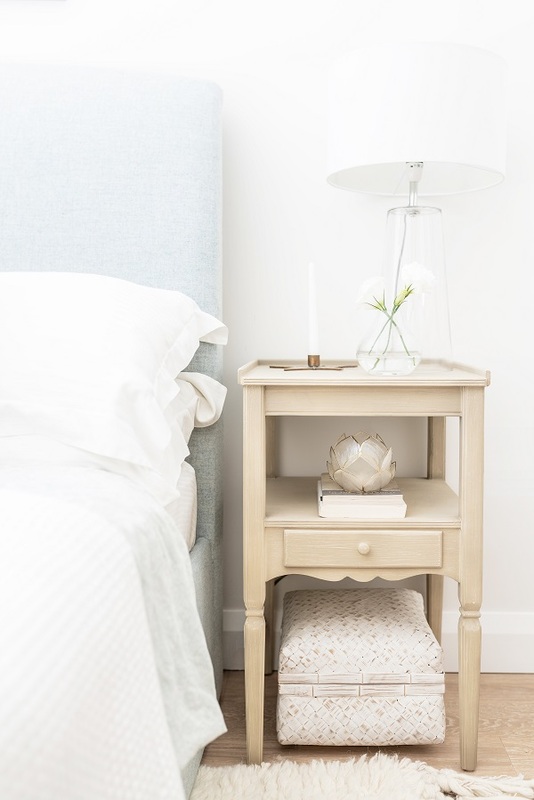 Bedside table - Carson - Swoon. Personally I am really happy with the master bedroom. The depth of green against the natural sisal flooring, the wallpapered wardrobe detail created an incredibly harmonious and intriguing space, which was finished off with some beautiful globe lighting which is a consistent feature throughout the design. I also love the blush pink touches that add a feminine accent. My clients absolutely love the overall design but in particular we solved their lack of storage through the inclusion of bespoke joinery in the living/dining area. We designed it to be unobtrusive but dramatic using hand less doors, ribbed glass and timber details with the use of and a singular dark colour for cohesion and impact. Ateliers J&J is launching a new collection : PARIS ! This new collection is presented this month in Paris at their showroom in the centre of Paris: le 114. In collaboration with the agency BASE DESIGN for Maison Debailleuil, the Ateliers J&J declined one of their iconic chair with a serie of upholstery from KVADRAT. J&J Ateliers are manufacturers who are constantly thinking about production. their technical knowledge allows customers a certain flexibility and to go beyond their initial ideas. Generally contacted for interior design such as bars, restaurants, shops or headquarters, their challenge is to work fast to set up a very efficient production system based on strong collaborations with their various suppliers. Nothing gets us more in the festive mood than wrapping the presents. With Bing Crosby playing in the background, the fairy lights twinkling and a glass of mulled wine within reach it’s an annual ritual to savour. Why not get organised and create a dedicated wrapping station and then you don’t have to do it all in one go? Much less disruptive than commandeering the kitchen table. Keep wrapping paper and tags in baskets for easy access and it’s a doddle to tidy up afterwards. All the products above are from Garden Trading who also have a great selection of gifts - see below. Do you have a theme? We like to get creative and choose a different style each year. It doesn’t have to be patterned paper either. Sometimes plain paper is the best idea if you want your decorations to stand out. All gift wrapping ideas and products above are by Ginger Ray. All gift wrapping ideas and products above are from the Night Owl range by Sophie Allport. All gift wrapping ideas and products above are from Paper Tree. Large basket from a selection at Garden Trading. Make the home more stylish and even more merry this season by going further with festive decor than ever before. This wallpaper design is perfect for people who want to give a room a touch of Winter Wonderland, but don't want to commit to a new wallpaper that's just for the holiday season. The wall design by MuralsWallpaper offers a tasteful option for holiday decor and is a wonderful way to get a more festive feeling at home during December. This wallpaper is perfect for putting up in the dining room to enhance a fancy festive dinner table set-up, or in the living room as a beautiful backdrop for an evergreen tree. The wallpaper is available in charming sage, beige, slate blue and heather grey color ways. Is there anything that says Christmas has arrived better than a homespun wreath? This Scandinavian-inspired Benni Brass Wreath ring from Rowen and Wren comes as a set of two and is an impeccable base (complete with brass ring and hanger) for creating a romantic, nature-inspired festive garland. Simply weave your greenery and feathers in, and attach and secure them with gardener’s wire. Don’t worry about being immaculate; there’s nothing more enchanting than a door adorned with cascading tendrils of twisting ivy and drying hydrangea heads. Hang your masterwork on the front knocker or alternatively bring the outside in and display it over the fireplace. What’s more it can be adorned with alternative flora and foliage throughout the year for seasonal displays in the summer months too. Sold in a set of two, one small - £26. We are so excited to share with you another fabulous collaboration from one of our favourite brands, Bluebellgray. Bluebellgray have paired up with fellow Scottish fabric house, Bute to create an exclusive collection of contemporary cushions and footstools! Like Fi, Bute are continuously inspired by the surrounding landscapes and countryside in Scotland. Since discovering how effortlessly their prints sit with Bute’s vibrant colour palette, Bluebellgray just knew they had to collaborate. Colourist: Colourful abstract block shapes in super scale, watercolour brushstrokes create a contemporary statement, designed specially to celebrate the launch of Bluebellgray’s new flagship store in Glasgow.